Añoreta is a good challenge for all players whatever level. Añoreta has a pleasant design surrounded by trees and water that enhance the natural beauty. The 7th hole has sea views. 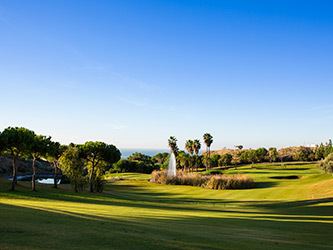 The 17th hole par 3, surrounded by a large lake and spectacular green. The 18th hole will captivate you for its beauty. Its abundant vegetation and all the water increase Añoretas natural beauty. Erbjudande 9x8-1 spelare gratis, 16x14- 2 spelare gratis gäller tom 31.12.14. En gratis tapa och öl för alla spelare.